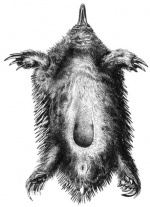 Monotremes don't give birth to live young like normal animals, but lay eggs. There are only three species of Monotremes; the Platypus, Short-Beaked Echidna, and Long-Beaked Echidna. They are only found in Australia and New Guinea. Monotremes are the only mammals known that lay eggs. This makes them unique from all other mammals, but they suckle their young, have hair, have a muscular diaphragm for breathing, and have one bone that makes up each side of the lower jawbone, just like normal mammals. They are also very close in anatomical proportions to reptiles, hence the fact that they lay eggs. Their body temperature, like reptiles, is subject to great fluctuation. They can have body temperatures ranging from 90 to 100 degrees fahrenheit. The Platypus has venomous spurs located on the back of the ankle, which are used for protecting territory, or fighting over a mate. The venom, however is not fatal to humans, but if someone were to get pierced with this spur, he or she would have pain and swelling for months. 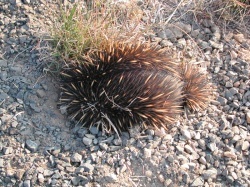 The Echidna looks similar to the porcupine, but have distinguishing characteristics as well. They have long, thin snouts, used as the nose and mouth, but they have no teeth. They are great diggers, and have short, strong legs to accompany this trait. They eat by tearing into a log or something soft, and stick their tongue into the hole and search for small insects, like ants. Monotremes also do not have any teeth, even in adulthood. Monotremes lay eggs. The echidna usually lays one egg, but on some rare occasions it will lay two, or even three. The eggs are soft-shelled and measure approximately 2/3 inch across, and are incubated for about 10 days. They stay in the mother and are fed and kept alive by her. Monotremes feed their young through milk producing mammary glands, until they are old enough to go out on their own. During mating the female lies flat on her stomach, often with her head and front legs partially dug in at the base of a shrub or small tree. The male begins digging along either side of the female. The male continues to dig on one side of the female, attempting to lift her tail end with one of his hind feet. He finally succeeds in raising her enough to be able to place his tail under hers while lying on his side. During the actual mating process, both animals push their tails against one another, tensing and relaxing the spines. The whole process may take from 1 to 3 hours, and then they go their separate ways. The platypus is found only in the eastern states of Australia, while the short- and long-beaked echidna are found on the island of New Guinea. Also, the short-beaked echidna is found all over Australia. A typical habitat of monotremes has running water, logs and snags to conceal entrances to burrows. In farming and forest areas they take up residence under trees, shrubs, and along roadsides and in uncleared patches of scrub. Most monotremes are solitary animals, but they do tolerate one another and they do not defend territories. Monotremes have an amazing tolerance for temperature extremes, but are highly vulnerable to heat stress. They will change their activity and movement, and avoid extreme temperatures by finding any available nest or rest sites, consisting of anything insulated from the environment; like rock overhangs, hollow logs, or abandoned burrows. Otherwise shelters may be a clump of grass or a pile of forest litter. This page was last modified on 24 July 2014, at 16:36.